Imagine staying put for 20,000 years without budging. 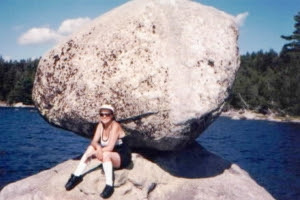 Balancing Rock on Jo Mary Lake in Central Maine and just south of Millinocket has been teetering in place since the last ice age 20,000 years ago. Glaciers formed many of the lakes in the northern USA, and rocks like the one shown in the photograph were left behind as the receding edge of the glacier fell apart and melted. This area of Maine was one of my parents favorite camping spots. Only 10% of the pristine lakeshore has actual camp sites, so the rest is pure wilderness. Photos of Balancing Rock are featured on post cards sold at the camping center, but until you actually see the rock in person the size is left to the imagination. The model aka spouse here was dropped off by boat and then I took the photo from 20 feet away. Tip: Act quickly to rescue the model. The fuse is short when stranded 50 yards from shore; humor may not be appreciated if they are from away. 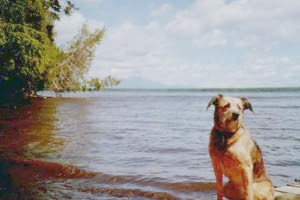 The second photo is my dog at Jo Mary Lake with Mt Katahdin in the background. If you are considering a day trip to visit and look around Jo Mary Lake, go on a Wednesday. For less than the cost of a fast food meal the evening beanhole suppers are incredible. Cooking the secret recipe begins the day before in cast iron beanpots buried underground to simmer 24 hours on natural wood coals. Although the lake is only about 1 mile wide, don’t make the same mistake as one unfortunate couple. 90% is wilderness, and 10% is swampy bogs with muck ‘n’ mire. Thinking a trip around the lake is a 3 hour tour? Think Gilligan’s Island. Tired, wet, cold, and muddy, the couple mentioned was rescued in the middle of the night. In addition to getting lost, they learned about our famous Maine blackflies the hard way.